President Edgar Lungu says he will not interfere with the operations of the investigative wings and that they are free to arrest whoever they perceive to be a suspect. And Mr Lungu says he will let the due process of the law to take its course in a case where Minister of Infrastructure and Housing Ronald Chitotela has been indicted by the Anti-Corruption Commission (ACC). The Head of State lamented that it is disappointing that people have continued to politicise the fight against corruption. 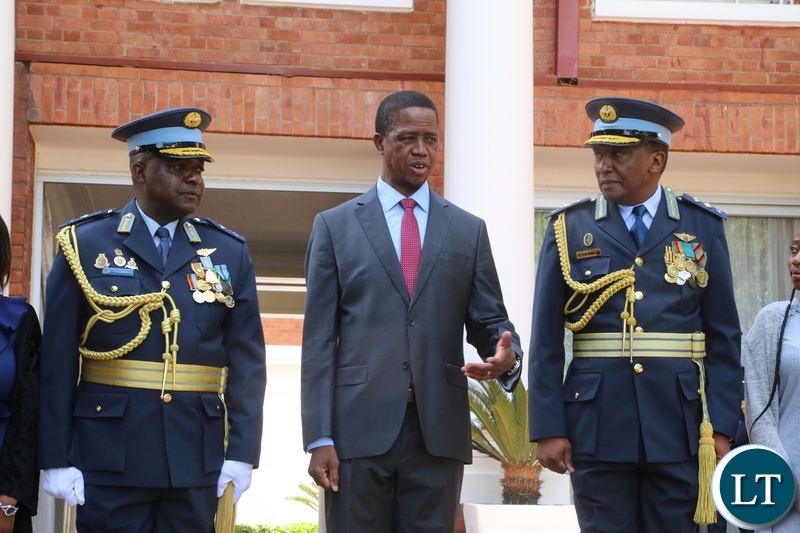 President Lungu stressed that it is not his mandate to direct investigative wings who to arrest, but that he will give them leeway and resources to carry out their duties. President Lungu said this shortly before he left for Sesheke, Western province to drum up support for the Sesheke central parliamentary candidate Dean Musule in the February 12th, by- election. The Anti-Corruption Commission on Tuesday arrested the Mr Chitotela with two counts of Concealing Property suspected of being proceeds of crime contrary to Section 71 subsection(1) of the Forfeiture of Proceeds of Crime Act Number 19 of 2010. Does that include Guy Scott for ‘possible’ copyright theft of President Sata’s death certificates and images used in his book? I am sure they’ll give him a nice muzungu clean cell! This is ridiculous. So he will not help investigation wings, by not interfering. Those ACC will not ransack state house staff offices if Ba Edgar don’t interfere. Bwana this is chance to gain some bit of respect, not to lose everything, including your wife who travel with domestic workers. 95% of Zambians are humble smart people, then we have the 5% made up of people like Patriot abroad that speak without thinking. Guy Scott thought I disagree with him, and his yellow maize used to be arrested and locked up with then opposition and real leader Michael Chilufya Sata. Patriot Abroad think next time please. You are interfering Sir, by not suspending Chitotela. Any sincere organization or company will put the accused on leave to allow smooth investigations. Gladys Nyriongo former minister of lands hasnt yet served her jail term. Judiciary is sleeping. so is Saviour Chungu the traitor your mate, wait for the next government, ask relatives of FTJ. Dr. Chileshe Commissioner General, Zambia Correctional Services, Sir can you issue a statement in Public interest and in the interest of our Justice system the position of convict Gladys Nyirongo before you are formally petitioned. Well said and truth be told there are times when someone can say enough is enough. Ba ECL please do not sack Chitotela, because sacking him will make you popular and at this moment we want to use Chitotela as an example of the corruption that exists in the PF Govt. Man Utd sacked Mourinho, now you see how they are performing. Now that the president has clarified his stance on investigative wings, we need someone to remove our shame for those 4 ancient Vigiligilis we are getting from the US LA. Also Kampyongo is a person ACC and DEC need to investigate. That’s a bold lie, i vividly remember when Lungu threatened investigative wings because they had not consulted him on some high ranking investigations. Why haven’t they arrested Kaizer Zulu for allegedly assaulting a police officer at Heroes Stadium among other things KZ has done? So Chitotela will be allowed to access his office and carry out his normal duties? He will interfere will documents and hide information cardinal to the investigations. He must be suspended forthwith or fired so the law enforcement agencies can do their job properly. This is the reason why people think that Lungu has some connection to what Chitotela has been doing all this time. The right thing is to suspend or fire him. Are we paying lip service to the fight against corruption or you are trying to wood wink the masses that you are fighting corruption when all you are doing is play to the gallery? Shame. Do you really think that Chitotela can keep documents that can implicate him in his office? You people, what kind of a thief keeps information or stolen items in his house? @Putya What do think was discovered at his house? Are you up to date with what is happening or you are just hallucinating from nowhere?